Sometimes certain games speak to you more deeply than they have any right to. Far beyond simply being enjoyable, this medium can on occasion throw up an experience containing a unique resonance that feels ultimately personal to you. It’s rare but when it happens it kind of knocks you for six, as it blurs the lines of escapism and reality. And Stay was the first title in a long while to do that to me. Quite an opening statement, I’m sure you’ll agree, enough to make you think what will follow will be several paragraphs of gushing praise and a whopping score at the end. But that’s not the case, and what follows is one of the most conflicted reviews I’ve written in a while. 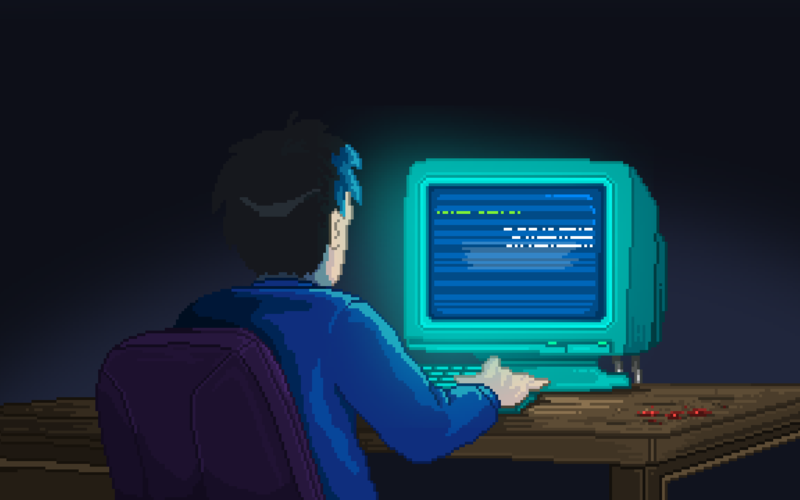 Stay, for the most part, is a heavily narrative-driven story, centring around you and Quinn, a man who has found himself in a dark and dingy room with only a computer for communication, and you are the one on the other end of the ethernet cable. He has no idea where he is, how he got there or why, and neither do you. 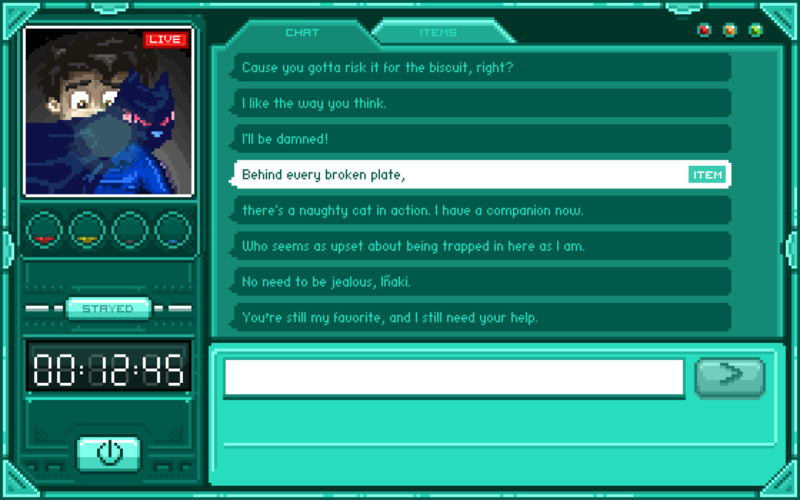 You interact with him via text message to guide him through his ordeal. But a blank text adventure this is not, because as well as the conversation history, you’re also afforded a visual of Quinn’s face at all times, as well as additional information about how he is feeling about his situation, as well as his personal feelings towards you. It sounds basic, and you’d be forgiven for thinking that a largely text-based experience coupled with a retro pixel visual style would be a pretty primitive experience, but it actually does a great job of creating atmosphere and tension. If anything the low-budget graphics allow the imagination to fill in the gaps, creating more immersion than a HD paint job would do. And the visuals are backed up with equally rudimentary, but well-placed soundbites for when well-timed shock tactics are employed or if the story needs to build unease or uncertainty, with eerie tunes or noises. But the reason for the title Stay, and the main reason for why it resonated with me, is that from the moment you start playing, the in-game timer will begin counting. Quinn needs your help from now on, and if you leave him, even if you switch off your PS4, Stay will act like you have left Quinn all alone. The game wants you to stay (clever, see?) 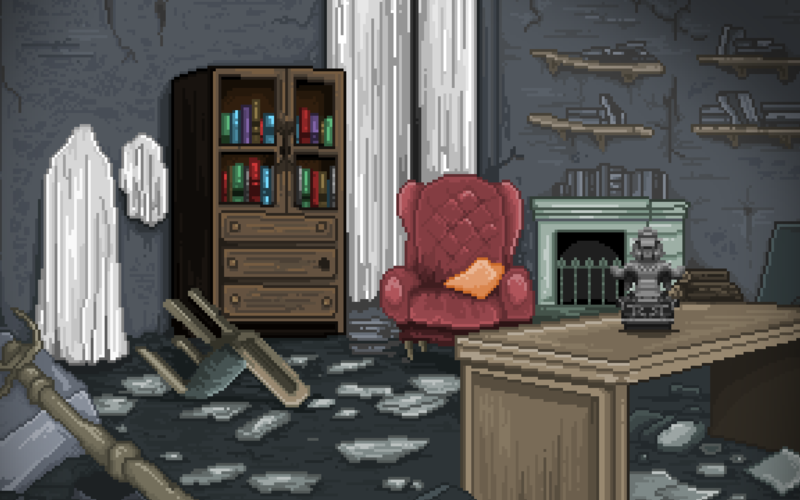 with Quinn throughout the adventure, and if you leave him to selfishly go have some food or sleep, it will be like he had been sitting there all that time in a strange house, waiting for your next message to come through to help him escape. If you wait too long there will be consequences. It’s powerful stuff that plays on my innate willingness to help people, and moreover my fear of upsetting or letting people down. I’m a people-pleaser and knowing that my actions and responses to him will impact how he feels about me and his situation is deeply moving. It elevating this experience above a bit of mindless fun, success and failure wasn’t personal to me, but extended to another, and so making sure I didn’t lose felt more important. As you make choices, there are consequences to the responses you decide to give. Sometimes all they do is change Quinn’s mood, for better or worse, but they can also impact how he feels towards you as well. Decisions can also lock out various conversation options, and in extreme cases even lead to an early end through Quinn’s demise. In some ways an even more heart-wrenching outcome was when a response I chose motivated Quinn to cease all conversation with me and destroy his communication device, feeling that he’d do better on his own than with my brand of help. If that sounds a bit heavy, it’s because it is, Stay is not afraid to deal with certain aspects of mental health, including anxiety, fear and loneliness, and it only serves to make this experience feel more real. It means every choice you make feels important and it comes with a certain amount of dread that you’ve said the wrong thing or accidentally offended this person you only know through a keyboard. Should you ultimately make the wrong choice, and be unfortunately down one friend, you get the option to restart from the beginning of any of the 24 chapters of the story that you have reached so far. Meaning that if you want to you can just replay a short section to get back to where you were, or play through more old chapters and change your responses, to put your relationship with Quinn in a better position next time around. It generally works well, although there are more responses later in the story that result in death, meaning more restarts, and you can’t skip or fast-track any of the conversation, even if this is your fourth time reading the same lines. There’s one particularly frustrating part towards the end, where you have to get a series of responses 100% correct or Quinn dies, and have to restart which feels incredibly frustrating, highly arbitrary and ruins the pace and immersion up to that point. And what’s worse is it’s near the end of a chapter meaning lots of seen-before dialogue and choices before the you get back to the main event each time. Another poor choice, was the decision to give you no upfront information before you start, leaving you to figure out what’s going on, and what you’re presented with onscreen yourself. Below Quinn’s picture in the top-left for example are four coloured bowls which change depending on how the conversation is going. After realising a press of the triangle button (on PS4) revealed more about my new friend’s feelings, I saw they were measures of the Four Temperaments, which luckily for me I recalled from back in my Communication Studies A-Level days. Basically a combination of each temperament dictates someone’s overall mood, so it’s simply a visual representation of the way Quinn was feeling, but this is never explained. I understand that a blow-by-blow account of the HUD at the start would be at odds with the overall tone, but the confusion I had through my first few exchanges because I didn’t understand the interface wasn’t a great experience either. There must be a better middle ground to introduce new players. But perhaps my biggest bugbear is when the engaging story that fleshes out its characters, and puts you firmly in control of the narrative stops, and you are presented with puzzles which you need to solve in order to progress. These start off fairly straightforward but before long become so obtuse that they become downright awful. Trying to second-guess what was in the developer’s heads is the challenge here, and more often than not I had to look up how to proceed online. Upon being shown the solution, I would often be throwing my hands up in the air shouting “How was I supposed to know I needed to do THAT?” The last thing you need in an experience that centres not only around your immersion, but also around staying with Quinn and helping him is a bizarre, nigh-on impossible puzzle that doesn’t even relate to the story or what you’ve learned so far. I wouldn’t mind if I’d missed an earlier clue, and that my responses were the reason for my misunderstanding, but no it just turns out these are just really difficult, obscure puzzles, and as such they break the flow completely and feel totally unnecessary. 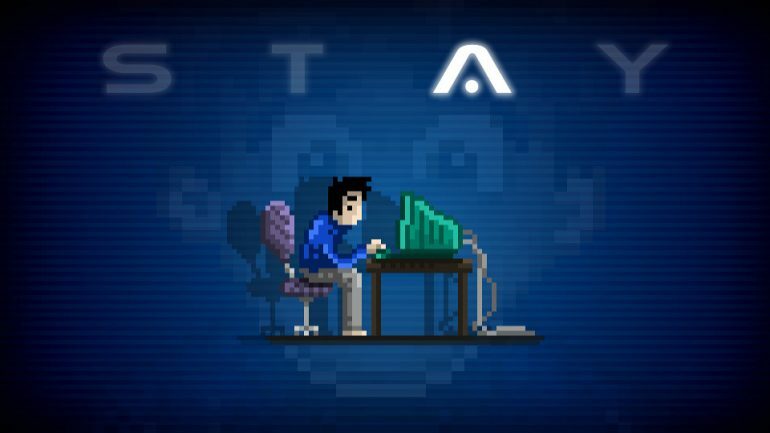 Stay wants you to complete multiple playthroughs, for different endings, and only titbits of information are revealed about what the whole story has been about in each one. But the problem is, after your first run through, it’s hard to feel as engaged second time around, much like watching a murder mystery when you know who the killer is. You’ll find in future playthroughs you’ll not be yourself in responses just to see what the outcome is, and in a stroke Stay loses its biggest strength – its ability to feel like you as an individual are part of the story. And the timer mechanic, whilst a clever addition, often just highlights the separation between reality and the game. In my case, personal commitments meant I went a day or so without playing and when I returned, because it had been tens of hours since I’d spoken to Quinn, he said a couple of parting words before he locked himself in a cupboard until he died. Thanks. And so with Stay, what you ultimately have is a flawed, missed opportunity. Its premise does a great job of hooking you in and engaging you from the off. You care for Quinn, you want to help him and learn about his past. 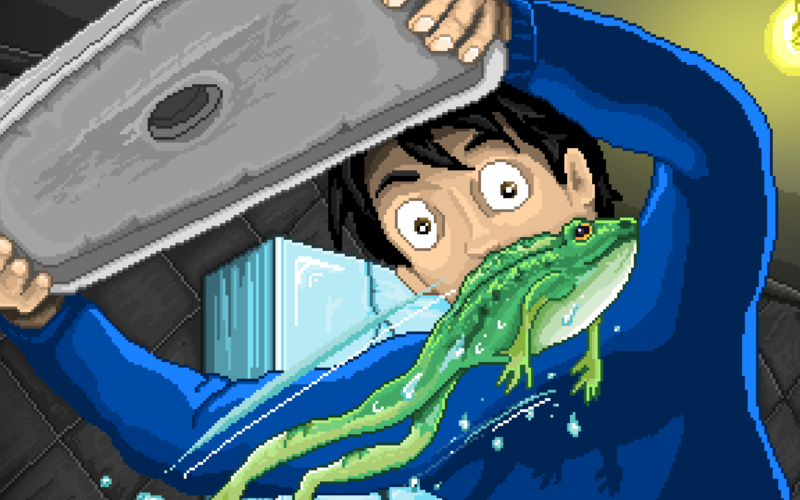 And then you’ll come up against a ridiculous puzzle and you might want to throw in the towel. Or if not then you’ll probably die repeatedly, and have to re-read the same text multiple times until you pick the correct response. Had there been a way to skip text you’d already read before, and just gotten rid of the puzzles altogether, this would have been a much more complete experience. And had you been given more guidance at the beginning, and more of a story reveal at the end, it would have book-ended an experience that would be truly memorable. As it is there are too many sticking points to make this a solid recommendation, even though this title made me feel things few games have for a long time.